Injectable muscle relaxing treatments are a very popular, safe and effective treatment to reduce lines and wrinkles. Aging skin and wrinkles result from a combination of many factors. It’s not just about cellular changes, collagen depletion, hormone loss, or damage caused by free radicals. After years of frequent contraction, those wrinkles can linger even after the muscles are at rest. Botox® (Botulinum toxin type ‘A’) is a purified protein produced by the Clostridium botulinum bacteria. It was developed during the 1970s – 1980s to treat blepharospasm (spasm of the eyelids) and strabismus (squint). In 1997 it achieved FDA approval for cosmetic use in the USA and by 2006 was granted a license by the MHRA in the UK for the treatment of frownlines. Worldwide, now more than 3 million Botox® treatments take place per year. Botox® is one of the many trade names for the neurotoxic protein called botulinum toxin that is produced by the bacterium Clostridium botulinum. BOTOX® is a prescription medicine that is injected into muscles and used to improve the look of moderate to-severe frown lines between the brows in people 18 to 65 years of age for a short period of time (temporary). It works at the neuromuscular junction by blocking the transmission of signals from the nerve ending to the targeted muscle. This reduces muscle activity that causes moderate to severe lines to form between the brows. This is called cosmetic denervation and it is a new use for an approved drug that has been safely utilised for eleven years to treat many neurological and opthalmological disorders. These procedures use a small amount of diluted botulinum toxin that enables controlled weakening of muscles. Similarly, wrinkles are caused by contraction of other delicate facial muscles like when you raise your eyebrows you form lines to the upper forehead and when you smile/laugh this forms crows feet. The result is not permanent because the nerve ending re-establishes it’s signalling by forming new nerve sprouts. This sprouting takes approximately 3-6 months, at which point the muscle regains it’s activity and the wrinkles begin to reappear. 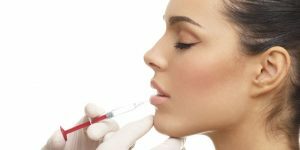 What Can Be Treated With Botox®? Botox® is most commonly used to reduce wrinkles on the face and can be used to reduce excessive sweating of the armpits and hands. Common facial treatment areas are: - Glabella (commonly known as frown lines) - Upper forehead lines - Smile lines (commonly known as crows feet). The result is not permanent because the nerve ending re-establishes it’s signalling by forming new nerve sprouts. This sprouting takes approximately 3-6 months, at which point the muscle regains its activity and the wrinkles begin to reappear. The results are not immediately visible but will become apparent within 3-14 days.